This is the first season of the show Tyler Perry fans have been hearing him allude to over the past couple of years. Tyler Perry's House of Payne airs on TBS at 9/8 central on Wednesday nights. Critics are killing it with bad reviews and I think I know why. I have watched a couple of the shows and I have to say that they are actually funny but ... now you know there had to be one. As I was watching, I thought the laugh tracks were grossly misplaced to the point where they made the show seem dull. There are some very funny and witty jokes, in my opinion, made on the show; however the laugh track completely ignores them and is instead placed somewhere that doesn't make any sense. The reason this is a problem is because it leaves the viewer wondering what was so funny that they felt the need to place a laugh track. Lets face it, when utilized properly, laugh tracks can be your best friend, but if they are over used or used incorrectly, as it seems to be in this case, they create an absolute disaster. 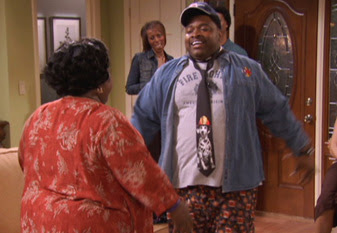 Bottom line, the laugh tracks for Tyler Perry's House of Payne are distracting at best. Now, the latest criticism that Tyler has not held silent on his the haterade being thrown his actors way. They are basically stating the obvious that a couple of the characters are fat black woman. Only the way they are saying it, is insulting. Well, TP wasn't going to take that. He fired back with a personal letter to his fans. From Tyler's fingers to your eyes (thanks EURweb). I am so with him on this although I'm all about promoting a healty life style. You all know that the critics have hated every thing that I have done over the years. Roger Ebert gave DIARY OF A MAD BLACK WOMAN-THE MOVIE an awful review, one critic called MADEA'S FAMILY REUNION-THE MOVIE the worst thing that he'd ever seen, some other critic said that DADDY'S LITTLE GIRLS shouldn't have ever been made and that I had to be stopped. Not to mention the plays, a critic in L.A. said of MADEA GOES TO JAIL, that it was the worst play he'd ever seen and that this type of show should not be at the Kodak Theatre, the home of the Oscars. So over the years I have learned to ignore these people and keep doing what I feel that I am being led to do. But when people begin to attack certain cast members of HOUSE OF PAYNE because they are overweight, then I have to say something. Just because a person is overweight doesn't mean that they are less than anybody else. That's why these people have not been able to get a job for years in Hollywood. One person even asked, "Why do you even hire them?" I hire all kinds of people--thin, not so thin, tall, short, in shape, not in shape, Black, White, Latino. When somebody comes to work for me I don't see color, I don't see their size, all I want to know is "Can you do the job?" One person asked why does the mama have to be a "FAT BLACK WOMAN" and said that I am perpetuating stereotypes by putting these overweight people on the show, as if there are no fat black women in America that are mothers. My mother and aunts are fat black women. And that upsets me to think that people, especially Black people, would say that I'm doing a disservice to America by putting them on T.V. Skinny does not make you beautiful. There are all kinds of beautiful women in this world. And if we begin to look at the heart of a person rather than prejudge then we would see that we are missing some of the nicest and most talented people in the world. I'm sorry but I had to get that off my chest. I just don't like to see good people hurt because of ignorance and intolerance. I won't apologize for putting these people in this show. I don't ever remember hearing any of this about ROSANNE. They deserve to be on this show. They are very good, caring, God-fearing people who needed a hand. And I am so grateful that so many of you are watching HOUSE OF PAYNE and making their dreams come true everyday. Listen to the related show!